This chart is two-sided, and covers all 6 stages of the Intro Diet. Want to heal your leaky gut? The Gut and Psychology Syndrome™ (GAPS) diet may be the way! The diet starts with a phase called the "Intro" Diet, which is an elimination diet. This phase of the diet is designed to heal and seal a leaky gut. The Intro Diet has 6 stages and can be complicated and seem hard to implement from the GAPS book itself. 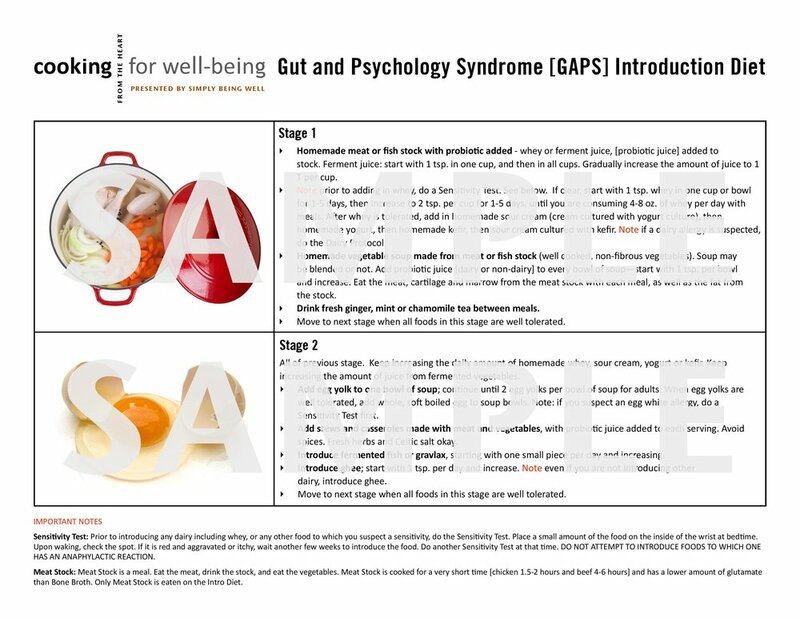 So… the GAPS Introduction Diet chart to the rescue! This chart has been created for those who want to start the Intro Diet, but don’t know how or are feeling overwhelmed and needing some guidance. I have taken a lot of material and made it easy to understand. Right here on one chart ... all the information you need to easily implement the Intro Diet of the Gut and Psychology Syndrome™ healing protocol. The chart plainly lays out each of the six stages of the Intro Diet ... what to eat, how much, and when to move to the next stage! It also includes instructions on how to do a Sensitivity Test. This chart is an invaluable tool when you are starting the Intro Diet of GAPS. Purchase yours today! This chart is only offered as an electronic download for 10.00. The download link will expire after 72 hours from now or after 3 attempts, whichever event happens first. Practitioners, please contact me for bulk orders of the chart on heavy card stock. For more information about the Gut and Psychology Syndrome™. Purchase a copy of the Gut and Psychology Syndrome and The Heal Your Gut Cookbook through my affiliate link. See my calendar for opportunities to learn more about the GAPS. Schedule a Wellness Consultation with me for help implementing the GAPS diet. I can work with you one session at a time, or for a three month or six month program. Note: The Gut and Psychology Syndrome™ is copyrighted by Dr. Natasha Campbell-McBride.